He transformed a club playing in front of just 226 spectators into contenders for a Champions League place. Now Stephen Kenny has been named as the man to take over from Mick McCarthy as Republic of Ireland manager in an innovative succession plan. But outside of the Republic, Stephen Kenny will be a name new to many football fans. Determined, thoughtful, astute, quirky, ambitious – the Dubliner, who turned 47 last month, can move from Donald Trump to Dundalk Football Club in the blink of an eye. Kenny will be the national side’s Under-21s manager before replacing the returning McCarthy after the Euro 2020 campaign. His appointment is reward for a run of success which has brought four League of Ireland Premier Division titles in five years, and two domestic league and cup doubles, for Dundalk. From AZ Alkmaar to Zenit St Petersburg, Dundalk – whose population of 39,000 is less than the capacity of several Premier League clubs – mixed it with top European opposition. It could be a movie: the down-at-heel club – just south of the border with Northern Ireland – facing relegation and potential oblivion. Instead they have been revived with the help of two local businessmen, a football-loving community and the boss who wanted players with a point to prove. In 2012, Dundalk FC was drowning in a financial whirlpool. Supporters mounted a ‘Save Our Club’ campaign to raise funds and the side only stayed in the Irish top flight because another team – Monaghan – went out of business. Next were the bosses of a nuts and bolts firm who decided Kenny was the man to revive the fortunes of the club they supported and had recently taken over. Paul Brown and Andy Connolly, owners of Fastfix, hammered out a deal after a meeting at his Donegal home where the future Dundalk chief produced manila files of handwritten notes. Goalkeepers. Defenders. Midfielders. Strikers. He had yet to take the job but had details of targets – players who had flopped elsewhere or lost their form. They had to be hungry for success… and they got it. 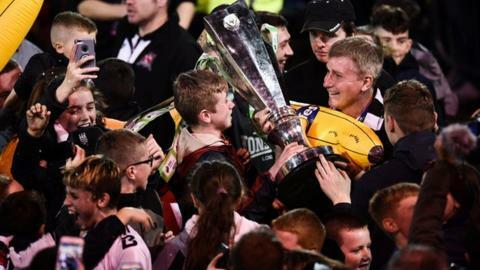 A year after taking over, Dundalk were the 2013 league runners-up. They were champions 12 months year later and did the league and cup double the following season. Travelling fans danced in Croatia after a Europa League victory in Hajduk Split. Back home, the country was waking up to their revival. When the club made it to the brink of a Champions League place, they faced Polish champions Legia Warsaw in front of more than 30,000 fans at the national stadium in Dublin. “This is beyond what we could have dreamed of,” Kenny told BBC Sport in 2016. Meaningless platitudes, tiresome cliches? Nah. That’s not Kenny’s style, as demonstrated by his much pored-over programme notes for home matches. “It is important to dispel the current train of thought that it’s in the DNA of Irish players to play a more direct style,” Kenny wrote before a match against Sligo Rovers. After a politically-heavy opening featuring the leader of North Korea, he brought it back to football and the Sligo game. “Kim Jong-Un, and also President Donald Trump’s jingoistic rhetoric and aggressive actions in contrast to new French President Macron’s opening Merci Mes Amis speech, were also on my mind. Dundalk’s early success under Kenny came via several players who had ‘proper’ jobs during the day, so they trained during the evening. Few central defensive partnerships in Europe would have boasted a meat seller (Andy Boyle) and a basketball coach (Gartland). But they are now a full-time operation that trains in the morning, pays players 52 weeks of the year, and have been taken over by an American investment firm intent on making the Lilywhites a regular at a high level of European competition. Dundalk missed out on a Champions League place in 2016 despite their stunning 3-1 aggregate win over Belarusian champions BATE Borisov, but more memorable nights followed. They drew with AZ Alkmaar in the Europa League and beat Maccabi Tel-Aviv to become the first Irish team to earn a European group stage victory. Only late goals denied the Irish side in two 2-1 defeats by Zenit, the Russian club whose turnover was 145 times that of Dundalk’s one million or so euros. Kenny credited the attitude of his hand-picked recruits, pointing to “a culture of desire to get better” among the players. “As a team there’s a selflessness, a genuine spirit there,” he said. Stephen O’Donnell – the easy-going midfielder and captain – cited “camaraderie” and the simple fact there are “no real bad eggs” in the squad. That’s down to Kenny’s background checks. After no title since 1995, they have been champions in 2014, 2015, 2016 and 2018. Last month’s FAI Cup triumph sealed a second double in four seasons and suggestions this was the greatest Dundalk side of all time. The difference is clear, and Kenny – who won the League of Ireland title with Bohemians in 2002-03 and led a Derry side to a draw against Paris St-Germain in 2006 – likes clarity. “Good characters and attitudes is important. We work with a small background team but clear demarcation. The roles are very specific,” said Kenny. He left Dunfermline after relegation, but had still taken them to a Scottish Cup final in 2007. Former Arsenal trainee O’Donnell, as one of Kenny’s first Dundalk recruits when joining from Shamrock Rovers, outlined his powers of persuasion. “When Stephen rang me, I had no motivation for going – that’s the truth. I wouldn’t have chosen Dundalk, who were after having a disastrous time,” he said. The skipper, who came back from serious injury to score the goal that clinched the first of those titles, said bringing Kenny in was “probably the best decision ever made”. Can Kenny cut it at national level? Kenny’s prospects of landing the national job were muddied by his lack of experience at higher level, but he baulked at the suggestion it might be a step too far. His track record and ideas brought popular grassroots support, with a rival club – St Pat’s Athletic – calling for him to be given a chance. McCarthy has been Republic manager before and only a penalty shootout defeat by Spain denied his side a World Cup quarter-final place in 2002 despite the spectacular Saipan fall-out with Roy Keane that saw the skipper head home. The irony of the former Ipswich Town manager coming in as old foe Keane goes, alongside O’Neill, is lost on no-one, while supporters ponder what might actually happen in 2020 if McCarthy thrives while Kenny is less successful. Kenny can nurture the younger players and then supervise. It is not dissimilar to the Gareth Southgate model that won praise as England reached the World Cup semi-finals this year. Few are as familiar with the League of Ireland, which has provided players with scores of caps in the current Republic squad. At Dundalk there are mixed feelings and shock. They will miss his nous and drive. But in the Lilywhites Lounge bar, alongside programmes on the wall from 1980s European Cup encounters against Tottenham and Liverpool, will one day be photos of the national manager. Their manager. “He’s put Dundalk on the map in a positive way, we’ve had TV cameras all over town and smiles on people’s faces,” reflected Connolly. At Shamrock Rovers, O’Donnell played under Kenny’s predecessor Michael O’Neill, who went on to led Northern Ireland to Euro 2016. So, how does he compare to Kenny? “They are both really good, but different. Michael is tactically very astute,” said O’Donnell. Now Kenny is in line for the biggest football job in his homeland.